Mango season is on and the “King of the Fruits” has been ruling the market. There are piles and piles of mangoes everywhere with each vendor swearing his fruit to be the sweetest of all. Various Varieties, different flavours are all there each juicy and delicious in its own way. Who does not love a squirt of nectar whooshing out into the mouth as you bite into a ripe mango? I opine that the best way to enjoy the fruit is to eat it the rustic way. Scoop out the stem and bit into it .The juice oozes out. Lick with tongue as it trickles down the fingers. It is fun and the feeling is heavenly. Preheat the oven to 190 degrees C. Grease and line one 6 ½ inch round cake pan. Whisk together flour,baking soda and salt. Keep aside. In a large bowl, mix sugar and mango puree. Add baking powder. Leave the mixture for 3 minutes. It will start bubbling. Add oil and vanilla essence. Mix well. Add flour mix to wet ingredients in three shifts mixing gently till well incorporated. Do not over mix. Reserve one tablespoon sliced pistachios and fold in the rest. Pour the batter into the prepared pan. Arrange remaining pistachios on top. Bake at 190 degrees C for 10 minutes. Lower the temperature to 180 degrees C and bake for another 40 to 45 minutes or till a toothpick inserted in the center comes out clean. Cool in the rack. Slice next day. I am so making this soon. 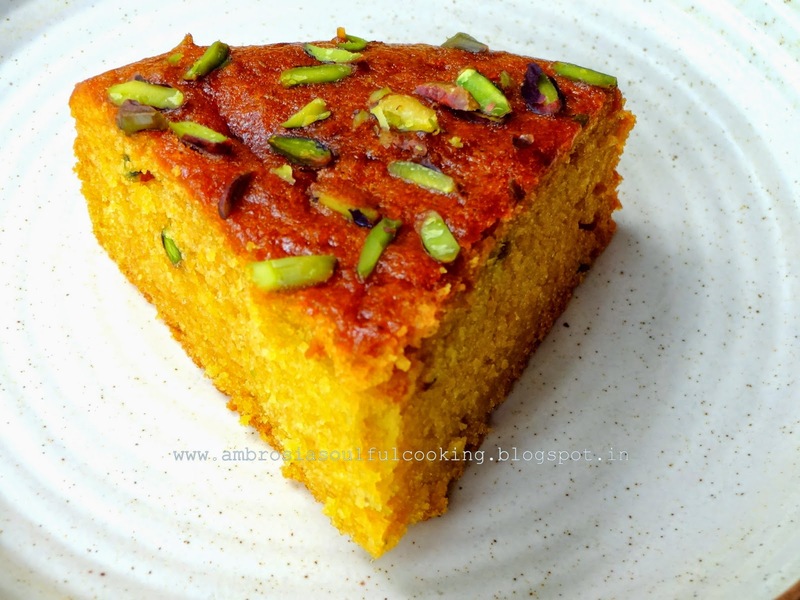 I have been thinking of trying a mango cake and here you are with a lovely recipe. Simply super! How lovely the pairing is... Mangoes and Pistachio! Yum yum yum! 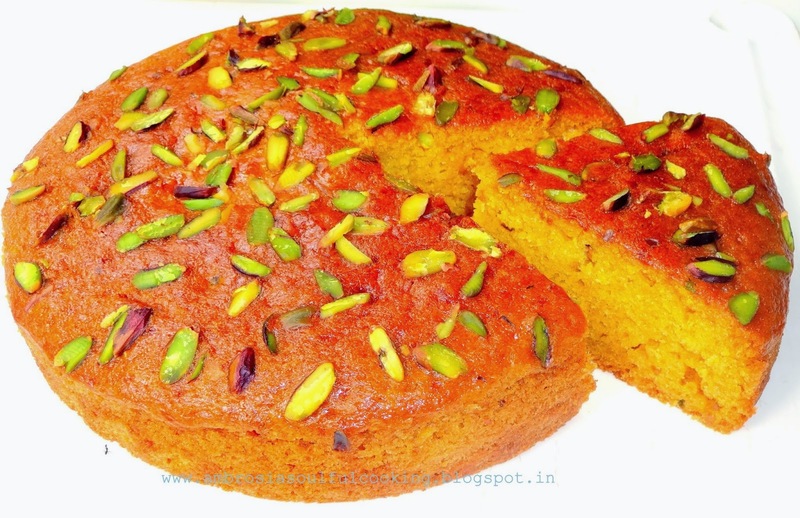 I should get right into baking with mangoes soon. Looks soooo good! 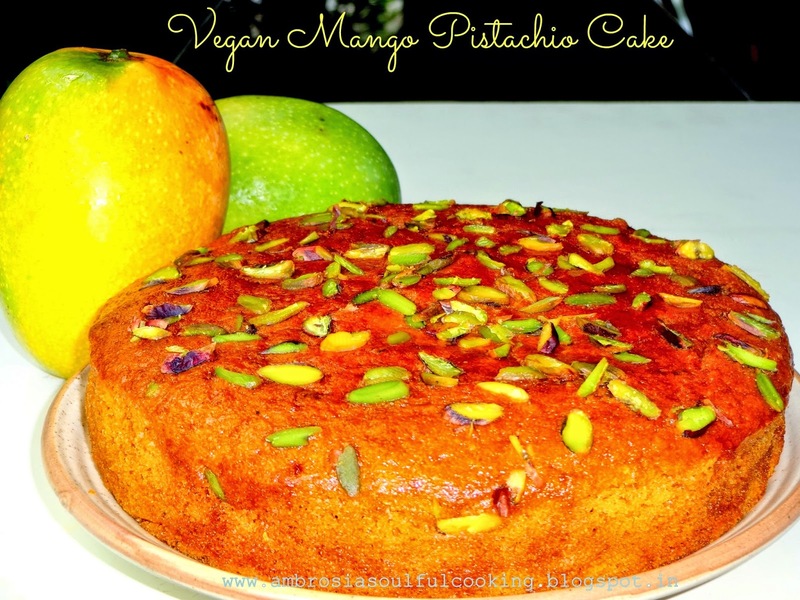 I love cooking with fruits and your Mango cake sounds very tempting. Baking with olive oil and fruit purees brings in so much flavor! 1- Whisk together flour, soda and salt. Keep aside. 2-In a large bowl, mix sugar and mango puree. Add baking powder. Leave the mixture for 3 minutes. It will start..
did you mean baking powder in step 1 and baking soda in step 2? Hello, This is my recipe and i came across this step after three attempts. I mixed baking powder in the sugar and mango puree mix. to this I added flour, soda and salt mix. The cake came out well. However, you can make a small change also. Add baking powder and baking soda to sugar and puree mix. This also works well. Hope your cake comes out well. Happy Baking! Thank you for answering my question , it turned out wonderfully, a bit dense yet moist, I added rose water and cardamom to the mix and a frosting made of quark, mango puree and truwhip which is a much healthier version of coolwhip.I like a no egg, butter, or margarine, and a healthier touch to desserts and this was perfect..
Hello, so happy to know about your experiments. Your frosting sounds heavenly.Thank You for sharing your experience.